After teasing fans with behind-the-scenes footage of a music video seemingly ages ago, RiFF RAFF has teamed up with MySpace to premiere a brand new Versace music video for “How to Be the Man.” The video is fitting for the rap game’s Neon Icon as it finds him surrounded by models in neon swimsuits, tripped out animated visuals ranging from the neon Pink Panther to neon sharks, and of course, neon admirers in the form of onlooking children eating snow-cones while being held by neon models and learning from the Neon Icon himself in a neon classroom. 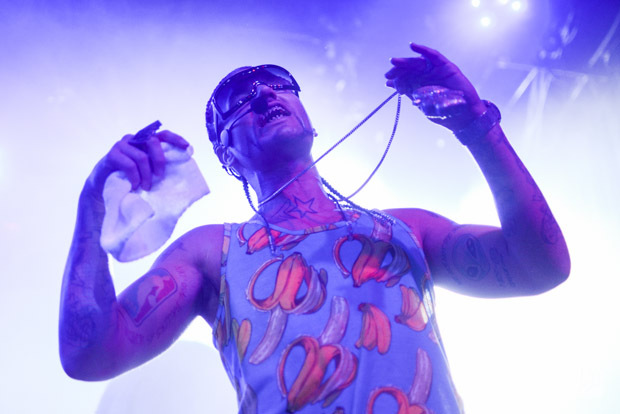 In non-neon words, it’s safe to say the visuals for “How to Be the Man” were more than worth the wait, especially now that RiFF RAFF’s long-delayed album Neon Icon is officially dropping June 24 via Mad Decent. So, follow the jump to check out the music video and head over to Jody Highroller’s official website for Neon Icon pre-order options once you’ve finished soaking up “How to Be the Man” in all of its neon glory. Riff Raff snowglobe now available for pre-order. I’m not even surprised.